An article titled "Controversy continues over 'treacherous' 1st Ewha President" appeared in the Korea Times a few days ago. It reports on Ewha University students who put up a sign Monday near a statue of the university's first president, Kim Hwal-ran, or Helen Kim, to draw attention to her "treacherous," "pro-Japanese" statements "under the Japanese occupation." The students said a continued failure to remove the statue represents the shameful history the country is in the process of eradicating. “Pro-Japanese activities are a crime that in no way can be justified under any circumstances. Many figures including Kim who committed such acts are still revered on the campuses of many universities,” they said. There's nothing wrong with highlighting the less-than-patriotic statements of public figures, but it seems to me what Helen Kim wrote or said was not all that uncommon at the time. It really should say above that her statements were made during the Pacific War. Saying "under the Japanese occupation" creates the impression she did this for years, and not under the extraordinary conditions of total war and "imperialization" of Koreans in the Japanese Empire in the early 1940s. While there are certainly people who deserve the label "pro-Japanese" (Yi Wan-yeong, for example), others fall into a much grayer area, particularly those who made statements during the war. Though combat never reached the peninsula (other than a few bombings), the Pacific War was still a time of suffering and difficult choices for Koreans, particularly for those drafted / coerced into the Imperial Army, labor battalions, or into becoming comfort women. Korean intellectuals and artists faced challenges throughout the colonial period, what with being educated most often in Japan but finding little chance for employment in Korea (see Chae Man-sik's story 'Ready-Made Life,' for example). During the Pacific War, however, they faced two options: to make statements or art supporting the war effort, or to not work. Some, like author Yi Tae-jun, retired to the countryside for the duration of the war (as detailed in his story 'Before and After Liberation' which is translated in On the Eve of the Uprising and other stories from colonial Korea). For most people, however, foregoing an income was not an option. To what degree intellectuals actually supported the war effort can be hard to tell. To be sure, some people were rather genuine supporters of Japan. That younger people would have supported Japan wouldn't be too surprising, considering that generation grew up under Japanese rule. Once the war started, some who were more critical of Western imperialism may have been happy to see Japan "liberating" Asia. As described in Mark Caprio's book Japanese Assimilation Policies in Colonial Korea, 1910-1945, for example, Yun Chiho responded to the "electrifying news" of Pearl Harbor by writing in his diary, "A new Day has indeed dawned on the Old World! This is a real war of races—the Yellow against the White." For the first six months of the Pacific War, Japan was winning (and did its best to hide its subsequent losses), so it wouldn't be surprising that some would have seen Japan as the right horse to back. To highlight their defeat at the hands of the Japanese Army, 1,000 British and Australian Prisoners of War captured in Singapore were shipped to Korea, marched through the streets of Busan, Incheon, and Seoul in late September 1942, and interned in POW camps in the latter two cities. Some POWs were ordered to labour in front of Koreans to emphasize how defeated they were. From accounts by these POWs, however, it's clear that many Koreans were sympathetic to them and did things like give them food. Even Korean POW guards shared information with them, wanted to learn English from them, or even, in one case at the end of the war, offered to give them their guns to break out of the prison camp. After the Great East Asian War our grateful citizens will always be moved by seeing in photos and newspaper articles the military exploits of the invincible imperial army, but today as we saw the POWs directly with our own eyes this deep feeling grew further and we were thankful for the efforts of the imperial army. Now as we strive to make greater efforts to impress upon those people the spirit and power of the empire, we deeply feel that we are in the glorious position of victorious imperial subjects and will ever more firmly resolve to win. Looking from the position of a religious person, I think again about the British and Americans when they came in the past with an overly proud attitude of arrogance, of only pretending to believe in Christianity, and also masking this. Now they have surrendered before the righteous imperial army and the day when they must keenly feel the sins of the past has come. The Korean name of Shirehara Rakujun was Baek Nak-jun, better known as George Paik, friend of missionaries and, up to 1939, a teacher at, and then dean of, Chosen Christian College. According to this book, Paik spent much of the war under house arrest, so one assumes he wrote the above column under duress. He went on to organize Seoul National University after liberation, became president of Yonhui College and oversaw its merger with Severence Medical College in 1957 into Yonsei University, and served as Minister of Education from 1950 to 1952. What Baek wrote (or what is attributed to him) is typical of that kind of writing that was in the Maeil Sinbo when the POWs arrived. It seemed as if the Japanese believed that by repeating mantras like "we felt ever more moved to have become imperial subjects and felt more keenly the deep desire to support the war to its end," Koreans would actually believe it. I thought Jun Uchida put it quite eloquently in her book Brokers of Empire when she spoke of "the veneer of submission that the majority of Koreans were forced to maintain under total war." Where should Baek be placed on the scale of collaborators and nation builders? 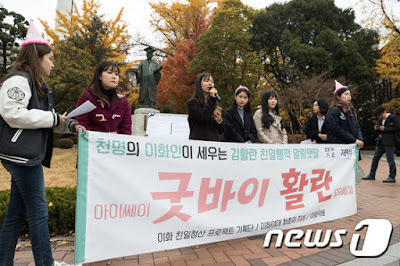 And what of Helen Kim, whose statue has so raised the ire of certain Ewha students? It's not an easy question, and is one needing careful examination of evidence, consideration of the pressure put on intellectuals and prominent Koreans in the 1940s, and the weighing of their actions before and after their statements. As Koen De Ceuster's "The Nation Exorcised: The Historiography of Collaboration in South Korea" and Don Baker's "Memory Wars and Prospects for Reconciliation in South Korea" make clear, however, the question of whether someone is guilty of collaboration is beholden to serving current political needs more than anything else. "Practically everyone in Korea is a collaborator. They all ought to be in jail." Needless to say, declaring the activities of artists to be "war crimes" pulls off the neat trick of making Kim Ku's "Practically everyone in Korea is a collaborator. They all ought to be in jail" seem moderate in comparison. Kim was right to some degree, in that everyone living in Korea had to make some kind of accommodation with the Japanese, regardless of how they felt. But admitting to such complexity does not seem to make for a useful national memory of the colonial period, so it's easier to draw a line and single out a small number of "traitors" who committed the sin of not resisting Japanese rule like the rest of the nation. As Don Baker pointed out, the argument between left and right in South Korea has not been over whether to allow for more or less nuance, but where to draw the line, with the left wanting Park Chung-hee and other elites connected to authoritarian rule and jaebeols included, and the right resisting this. The text in red reads "I say goodbye Hwal-ran, okay" in English, but written in Hangeul. Ignoring the rudeness of using her first name, I couldn't help take note of the English in use on the sign. This actually dovetails into a thought experiment that came to mind some time ago in regard to the question of collaboration. Namely, what would happen if North Korea took over the South and and had to deal with a population that included many, many people who had links to the Korean race's eternal enemy, the United States? Would being able to speak English be cause for suspicion? (One assumes many English loan words would be excised from the language, as South Korea's Yusin government announced it would do in 1976.) Defectors have already spoken of the North Korean military's plan to set up camps to exterminate "half breeds," but what of people who had, say, studied in the US? They might say they were just trying to improve their lot in life, that it didn't mean they had any great love for the US, but if the North Koreans used the fundamentalist logic of the Institute for Research in Collaborationist Activities, they'd be sent off to camps - or worse - with little debate. While the excuses they might make for their "collaboration" with the US - a nation that some even now declare is "occupying" Korea - might suffice to justify themselves in their own eyes, it seems such latitude is not to be extended to people faced with difficult choices more than 70 years ago. All things considered, the issue of collaboration is a complex one, and is part of a debate which is still very much unfinished in Korea - as I believe much related to the colonial era will continue to be, as long as the country is divided. So it might be worthy of a bit more gravity than party hats and the equivalent of shouting "Na na na na, hey hey hey, goodbye." I wonder about the penultimate line. It makes unification sound like a panacea - which is pretty much how it functions in Korean discourse. One might imagine though, that faced with the challenges of unification, Koreans' energies might be diverted from the historical blame game; or that the inevtibale controversies of how to effect unification will simply fan the flames anew. Good point; that statement does make it sound like a panacea. Being a key, unfinished leftover from WWII (Japanese still hasn't normalized relations with the north) I think it would solve at least some problems... but, yes, reunification is likely to be messy, and, assuming the ROK absorbs the north, and considering how defectors are treated in ROK society today, should the development of the north be followed in the state-jaebeol-led fashion of the ROK, it's not hard to imagine the current left-nationalist narrative being retooled by activists and politicians wanting to appeal to northerners' sense of victimization, of being left out, with "the pro-Japanese clique who suppressed democracy and developed the ROK for their own benefit on the backs of the minjung" extending their unjust rule into the north.